Arcimoto defines the Fun Utility Vehicle category, and it may be the ultimate city vehicle. All over the world, the transportation industry is a major contributor to global warming. Statistics show that not less than 15% of carbon emissions come from transportation equipment including personal cars, trucks, and vehicles. Personal cars seem to be particularly implicated due to the growing nature of the automotive industry, particularly in the developing nations. Asides the obvious problem of air pollution created by personal cars, the expanding nature of the industry means we also have a space problem on our hands. The number of vehicles on our roads have more than doubled over the past 40 years. When you factor in the population density challenge in many urban centers, it’s easy to conclude that there are already too many cars occupying too little space. The problem is highlighted by the traffic congestion experienced in these areas. But car ownership is a sign of economic prosperity. Trying to convince people not to buy more cars looks like an impossible task. The perfect solution for the current challenges would be to develop cars that produce little to zero emissions and are compact enough to occupy much less space. Enter the Arcimoto three-wheeled Electric Vehicle. 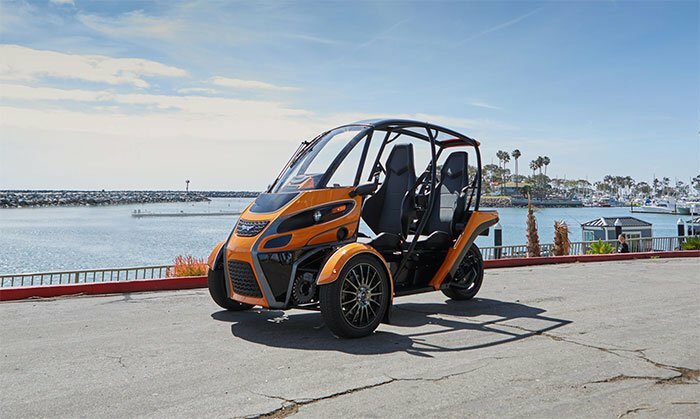 This masterpiece from Arcimoto ticks all the right boxes when it comes to providing solutions to the challenges facing the modern automotive industry. With its quasi-motorcycle feel, the Fun Utility Vehicle (FUV) delivers a thrilling ride with exceptional maneuverability. And you don’t have to worry about tripping over like you’d have to in the case of a regular motorcycle. If you are looking to enjoy a day out with your friend or loved one, there is no better, more environmental-friendly option than the Arcimoto FUV. While the Arcimoto FUV may not be the best option for a long road trip, it is perfect for covering short and medium distances. The motorcycle classification means you can weave in and out of traffic with ease and you do not need to search frantically for a parking space wherever you go. The vehicle can reach a top speed of 80 mph. It comes with a base level 13 kWh battery that could take you all of 70 miles. If you are looking to commute even longer distances on the vehicle, the larger 20 kWh battery pack presents an even more exciting option with its 130 miles range. The battery charges via a regular 110V wall outlet at the rate of 10 miles’ worth of charge after one hour, and a level 2 charger will juice up the vehicle at the rate of 40 miles in one hour. An expandable frame architecture makes this vehicle more than just a glorified bike. It accommodates a removable enclosure option if you feel you need even more protection. Furthermore, there are bolt-on accessories that makes it easy to carry your bike, golf bag, surfboard, and other bulky items. In the event that you require more secure storage, the optional locking tailbox for the rear compartment is always there for you. Arcimoto defines the Fun Utility Vehicle category, offering full comfort for two passengers with gear, optimal urban parkability, and ultra-efficient operation, at a target base model price of $11,900. If you’ve ever harbored any concerns about the sustainability of the transportation industry, Arcimoto is here to change the narrative. And the Arcimoto FUV is a giant step towards achieving that.